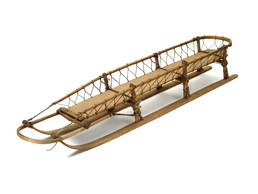 This Russian style dog sled was widely used by eastern Siberian peoples, including the Koryak, Itelmen, Chukchi, and the Nivkh on Sakhalin Island. In steep terrain the driver grabbed the vertical hoop for balance. Along with new styles of sleds, Russians introduced the “in-line” method of dog harnessing that is used today. The earlier indigenous practice had been to hitch a fan of dogs to the front of the sled, each on its own line.